The Fern Cottage Yacon (Polymnia edulis) crop has been very prolific this year and so we are able to offer growing tips for sale. Our Yacon crop is grown in the open on our Yorkshire smallholding. It was not given any special treatment throughout the year but it wasn't planted out until May. We find that our Yacon accelerates into growth after the longest day and we have not noticed any slug damage which could be a result of its pubescent leaves. The only pest we have observed is an as yet unidentified brown caterpillar which only shreds the odd leaf before pupating or perhaps loosing interest? 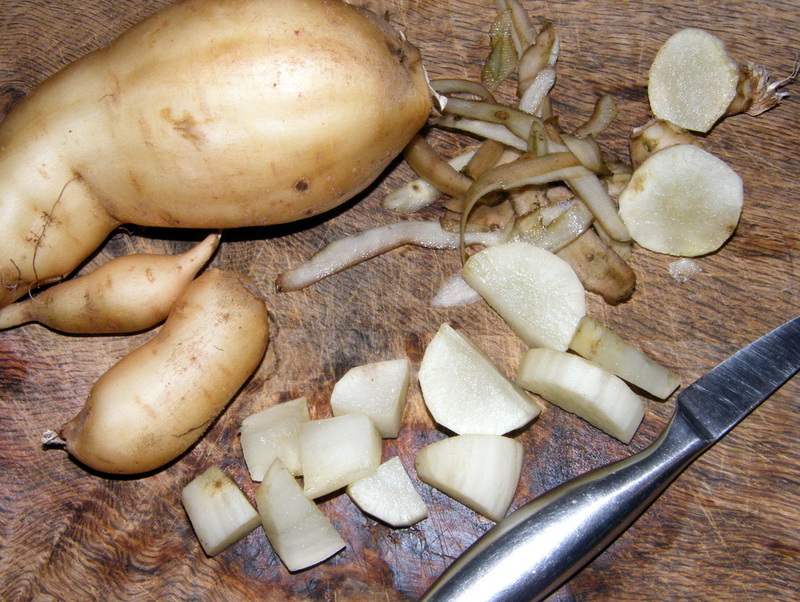 Yacon is recommended in various literature but we think this is perhaps due to its novelty rather than any serious competitor to the standard vegetables. Indeed it has little nutritional value as the sugars it contains (inulin) cannot be digested by humans since we lack the necessary enzymes. However, we have read several reports of its beneficial effects on human gut flora. We can best describe it as tasting like 'crunchy water' with a hint of sweetness and perhaps pine. It can be eaten raw, shredded in salads or added to stews. When cooked it retains its shape and takes on the other flavours in a dish. For more information we recommend looking at Plants for a Future. On receiving your sections we recommend that you pot them up immediately using a very free draining potting mix, we use 50:50 compost with grit sand or perlite. Treat them like you would Dahlia tubers. They don't need such a free draining mix when actively growing, in fact they're not at all fussy but this helps prevent over watering when dormant. Keep them frost free and that's it, they'll grow when they think it's warm enough. Harden them off when about 10 -15cm and don't leave them under cover too long as they will become leggy and collapse. Don't panic though as new growth will soon emerge from the base. The best bit is that after you harvest you'll have many more sections to make new plants. We started with one plant two years ago and this year we planted 50 by dividing the plants further when only small. Let us know if they impress you more than they did us. After this years harvest we are going to make a syrup by pulping the tubers, it is suppose to be very sweet but without the calories, we'll give you our honest opinion once we've actually tried it ourselves.